Summary: We describe an infant in whom partial rhombencephalosynapsis was diagnosed by using MR imaging. The anterior vermis and nodulus were normally developed, but part of the posterior vermis was deficient. There was partial fusion of the hemispheres in the inferior part of the cerebellum. Partial rhombencephalosynapsis is described for the first time, and our findings support the recent embryologic observations. Recently, more attention has been paid to rhombencephalosynapsis in the literature (1, 2). Rhombencephalosynapsis is a rare disorder consisting typically of vermian agenesis or severe hypogenesis, fusion of the cerebellar hemispheres, and apposition or fusion of the dentate nuclei. More than 40 cases have been reported so far, and a review of the literature has recently been published (2). A recent report suggested that the traditional view of the cerebellar primordium as a paired structure should be questioned (3). Sidman and Rakic proposed the cerebellum primordium as an unpaired structure, and their observations were thought to better explain the pathogenesis of rhombencephalosynapsis (4). A 2890-g boy was born at term by normal vaginal delivery as the second child to healthy unrelated parents. The boy was < p3 for length, weight, and head circumference, and there was evidence of facial dysmorphism: no eye brows, broad nose bridge, hypertelorism, frontal bossing, small ears and mouth, long thin fingers, bilateral cryptorchidism, large ventricular septal defect, imperforatio ani, and Hirschprung disease. Routine chromosomal examination was normal (46,XY). Cranial MR imaging showed absence of the septum pellucidum, partial fusion of the thalami, fusion of the colliculi, and delayed myelination. There was evidence of brain stem hypoplasia. The thinning of the corpus callosum was secondary to chronic stretching from hydrocephalus. There was partial fusion of the inferior part of the cerebellar hemispheres and dentate nuclei (Fig 1). The anterior vermis could be clearly identified, as well as the nodulus (Fig 1A and D). The tonsils were absent, and the uvula and pyramis could not be identified; however, the prepyramidal fissure, which separates the tuber from the pyramis, and the secondary fissure, which separates the pyramis from the uvula, were, to some extent, present (Fig 1C and D). Possibly the tuber was partly present. The upper part of the cerebellum appeared normal. A dynamic analysis of 3D gradient-echo T1-weighted images from the level of the medulla oblongata toward the midbrain showed a rotation of the cerebellum in the transverse axis (Fig 1B and C). Axial T2-weighted double-echo short tau inversion recovery image (A), axial 3D T1-weighted gradient-echo images with a 1-mm thickness (B, C), and sagittal T1-weighted spin-echo image (D). A, An axial section at the level of the pontomedullary junction shows the vermis separate from the hemispheres at the level of the anterior vermis. B and C, The rotation of the cerebellum in the transverse axis can be observed. C and D, The prepyramidal and secondary fissure in the partially fused inferior cerebellum can be recognized (arrows). D, The sagittal image demonstrates the normal appearance of the anterior vermis and the thinning of the corpus callosum. Rhombencephalosynapsis, first described by Obersteiner in 1914, has recently attracted the attention of several researchers both in the field of neuroimaging and in the field of neuropathology (1, 2, 5). The malformation consists of a fusion of the cerebellar hemispheres, the middle cerebellar peduncles and the dentate nuclei and is thought to occur following an insult between the 28th and 44th day of gestation (ie, before the formation of the vermis). Ventriculomegaly, an absence of the septum pellucidum, and fusion of the thalami are common. Hypoplasia of the commissural system and the anterior visual pathway and agenesis of the posterior lobe of the pituitary, which occur at approximately the same time, can occasionally be seen. The posterior fossa is smaller than normal. Musculoskeletal, cardiovascular, urinary tract, and respiratory abnormalities have been reported in several patients. It has recently been suggested that the embryologic defect affects the “isthmic organizer” at the mesencephalic-metencephalic border. Molecular analysis of dorsalizing genes, such as Lmx1a, which regulate early developmental events at the pontomesencephalic junction, may reveal a mutation or mutations unique to rhombencephalosynapsis (6). Utsunomiya et al (3) suggested that the traditional view of the cerebellar development was not consistent with this malformation. The traditional view considers the paired rhombic lips as the embryonic primordium (7). In the traditional view, rhombencephalosynapsis was considered as an abnormal development of the vermis with subsequent fusion of the hemispheres (7). The more recent view of Sidman and Rakic considers the cerebellar primordium as an unpaired structure where the posterolateral fissure is the first to be formed with subsequent development of the posterior vermis before the anterior vermis (4). In this view, rhombencephalosynapsis is considered as a failure of vermian differentiation with undivided development of the hemispheres. 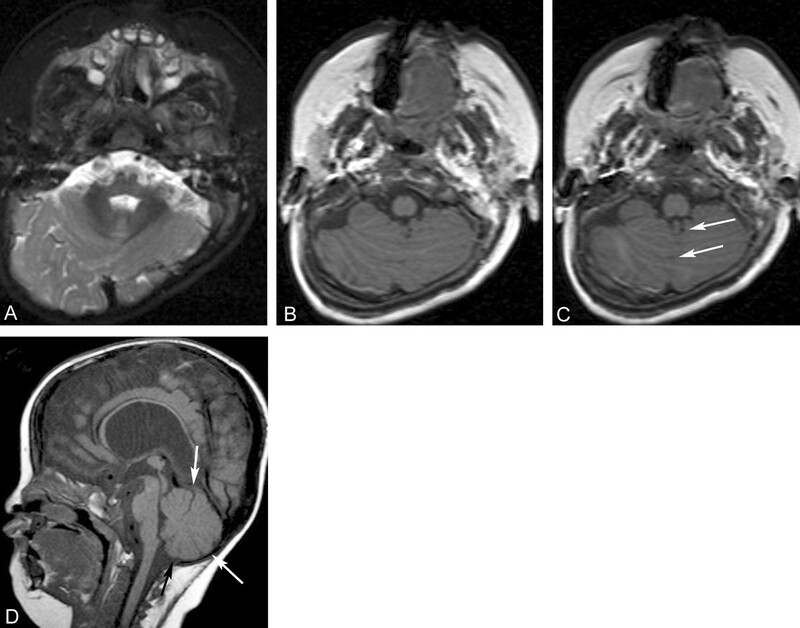 Takanashi et al (8) reported a case of a child with partial fusion of the cerebellar hemispheres, which was not considered to be consistent with rhombencephalosynapsis mainly due to the absence of transversely oriented folia and the presence of folial dysplasia. He mentioned the rotation of the cerebellum during embryogenesis. This phenomenon has been studied in detail and complements the observations by Sidman and Rakic (9). It has been suggested that the cerebellar primordium develops in the roof of the metencephalon, which will become divided into a median vermis and a pair of hemispheres because of rotational forces directed outward with eversion of the cerebellum resulting in a so-called fissure fracture between the vermis and the hemispheres (9, 10). The hemispheres, which develop from the lateral parts (rhombic lips) of the cerebellar primordium, grow more rapidly, and the cerebellum will turn around its transverse axis in the caudal direction. This rotation was visible in our patient, when the axial 3D gradient-echo T1-weighted images were analyzed dynamically. We suggest that the rotation was arrested prematurely at the time of fusion. It is accepted that the development of the cerebellar hemispheres and the vermis are to be considered as a closely related and simultaneously occurring process. This explains why partial fusion of the inferior part of the cerebellar hemispheres was seen in the presence of a primitive secondary and prepyramidal fissures vermian fissures. Our observations demonstrate the presence of the nodulus and the anterior vermis and absence of part of the posterior vermis with only partial fusion of the hemispheres in the inferior part, in the presence of the prepyramidal and the secondary fissure. This is consistent with the knowledge that flocculonodular lobe develops first and is followed by the anterior lobe and finally the posterior lobe (7). It should be mentioned that this observation contradicts the theory that the posterior vermis develops before the anterior vermis (4). Alternatively, one might suggest that a mutation of a gene caused a mild disturbance of the formation of the posterior vermis but no effect on the formation of the anterior vermis later on. To our knowledge, partial rhombencephalosynapsis has never before been reported. We suggest that rhombencephalosynapsis should be considered as a malformation with a variable degree of severity. The observed abnormalities are consistent with the recent insights in the cerebellar embryogenesis.